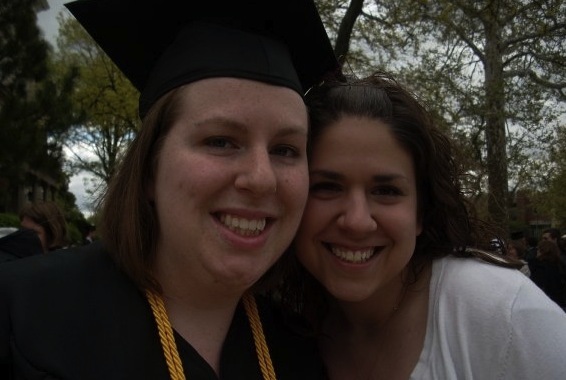 My 21-year-old self, left, with my then-roommate and best friend Mallory. Each week, I get to go out and harass people do man-on-the-street questions for my newspaper as part of a biweekly feature. I have to approach strangers and ask them two questions and take a mugshot of them, and it’s about as awful as it sounds. Especially because a lot of people say dumb things (like that the movie awards show they’re most looking forward to is the Country Music Awards) or they don’t want their picture taken (I think a fourth of St. Joseph is wanted on warrants or something). I try to be polite, pitch them what I’m doing and always let them see their picture and allow retakes. Sometimes it works. Sometimes…it does not. Recently, I’ve been on a roll with good answers, but I think it’s because I’ve been doing them at big events, not the mall. Today I went to cover a college graduation and decided to pattern my questions off it. I asked, “What do you wish you knew at 21/22/the majority of the graduates’ age?” and “What job-hunting advice would you give the graduates?” I got some pretty good answers. One guy stumped me when he turned the tables on me and asked what I would say to the first one, and thought it might make a good topic to cover here/also ask others. 1) I wish I’d known that everything was going to be ok.
Obviously, you don’t know this when you’re in the middle of it, but things tend to turn out better than you’d expect and your deepest fears tend to be unfounded. I had a mini existential crisis about graduating, particularly in the middle of a terrible job market in a hard-to-break-into field. Somehow things lined up and it all turned out ok. Mostly. 2) I wish I’d known that the grass isn’t always greener elsewhere. There is no perfect place to live. Even if it’s sub-tropical and warm in the winter and not-the-midwest. I missed a lot of time with family and friends the years I was in Florida, which was something I didn’t expect. However, I’ve learned and will never, ever accept a job where they (churning staff, people who flinch when they think they hear a boss’ laugh, bosses who emphasize loyalty and doing what you’re told as their top things that are important to them) are exhibited. It’s so not worth it. Those are a few off the top of my head. What do wish your 21 or 22-year-old self knew going into the world, rather than having to learn it the hard way?